The Beatles Were Fab (and They Were Funny) by Kathleen Krull & Paul Brewer, illustrated by Stacy Innerst. Grades 2-5. Harcourt Children's Books, March 2013. Unpaged. Review copy provided by the publisher. John, Paul, George, and Ringo - names known all over the world for their iconic music. But the Fab Four didn't just love music. In addition to being gifted musicians and pop stars, the Beatles were four friends who loved to laugh and be silly. This picture book gives a brief overview of the Beatles from the band's formation through its meteoric rise in popularity, always emphasizing the funny side of the Beatles. The Beatles used humor to keep their spirits up as they performed show after show as they were gaining their foothold. And they laughed and joked their way to the very top. The book includes specific examples and quotes, including specific jokes cracked in various interviews with each of the four. This is a jolly celebration that would make a perfect gift for the children of Beatles fans and for kids who have grown up listening to their music. It's not a book that kids will use for their reports, but I can see it becoming a beloved favorite in a family of Beatles fans. The text follows the Beatles chronologically from naming the band (1960) to their last major concert in Candlestick Park (1966). Fun facts are sprinkled throughout the book, like the fact that the Beatles let fans know that their favorite candy was English jelly babies, but American fans, unable to procure the British sweet, pelted them with much harder jellybeans instead. The illustrations pair nicely with the upbeat, humorous text, depicting bobble-headed (and quite recognizable) Beatles and incorporating quotes, jokes, and song titles in a way that really works to support the text and the entire feel of the book. Back matter includes a basic timeline and a list of sources. Of course, this is perfect reading for Beatles fans, but it's a great book to introduce the Fab Four and give a brief introduction to Beatlemania as part of a classroom unit on the 1960s. As a Beatles fan, I have to say that this is a must-buy for your library shelves. And I've already got at least one child in mind for whom I'll be buying this book! 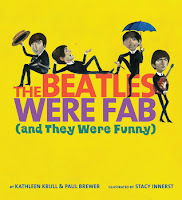 The Beatles Were Fab (and They Were Funny) will be on shelves March 19. Happy Nonfiction Monday! This week's roundup is hosted by Roberta at Wrapped in Foil, so make sure you check it out!